Hello, friends! With my sister's wedding now over (tear) I have been enjoying coming home after work and not diving into any planning or decorating. But I always start to feel restless when I am not productive so I am happy to be returning to DIY projects and home décor. I have promised myself that I will finish any projects that I have yet to complete and for anything new, I am trying not to spend by using supplies I already have on hand (we'll see how long this lasts :). Today I am sharing some simple DIY wall art I created. I found my inspiration from this Target Style print. I picked up a couple of blank canvases from the dollar store (which yes, this was a purchase but justifiable because they were only $1). I had black paint on hand as well as a small circular foam sponge. I used painted tape to create a 1.5in border around the canvas. I dipped my sponge into my paint and wiped off the excess. I started in the top left corner, overlapping onto the tape. I sort of smudged and dragged the sponge as I didn't want to create perfect circles. I worked my way across stamping left to right. I completed this in rows down the length of the canvas until I reached the tape along the bottom and then removed the tape immediately. You could leave your print as is but I decided to frame mine using a spare 1x2 I had in the garage. I made a really simple frame, not even using 45 degree angles at the corners, instead just overlapping the wood along the top to attach to the sides. I used a table saw to make my cuts and attached using an air nailer. I stained my frame using Minwax Dark Walnut prior to inserting the canvas. I used a few nails to secure the canvas to the frame as well. See, super simple right? I think TK was laughing at me when I said I was making wall "art". But I am super happy with it and have it hung proudly in our dining room. For my next piece, I used a smaller canvas and painted it using Behr Poppyseed leftover from my master bedroom accent wall. Next I grabbed an empty toilet paper roll from the recycling. Yes, you read that right. I dipped the end of it in some white paint (Behr Ultra White semi gloss I have on hand for trim and what not). Again, I used a stamping "technique" and covered the entire canvas in rows of white circles. Again I didn't want perfect circles or placement so I was careful not to get too much paint of the paper towel roll and only lightly stamped it on the canvas. You can see that a few have a heavier outline but I like that each one is a bit different from the next. I also chose to add a frame to this guy but you could obviously leave it as is and it would look great. I had a pressure treated 1x1 in the garage and I used the same method as above to create a frame and attach it to the canvas, the only difference is I did not stain it. Again, really easy! 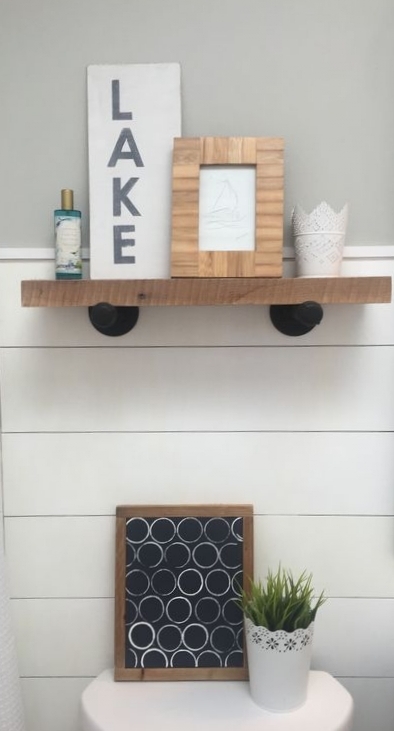 A 4 year old could make these (sans frame) and you would never know that I didn't grab these from Homesense since abstract is in!